I want to start off by saying, as a very long time Premium member, this was definitely a much needed & long over-due upgrade. The new houses are great & the fact you can change the house on that same lot without moving is even greater. I am already really loving my new Linden Home. That being said, there is something I would like to address/suggest. Although there are many interior wall options, they're all light & bright, mostly all bright pastels (even the brown is a "bright" brown). It would be awesome if there were also the same options of darker/duller interior walls available. I have suggested in another thread that creators could sell packs with inner walls that fit perfectly around windows and doors, so we can use our own textures. Total freedom. I have counted it, and I need to fit together 12 prims in the room with 2 windows and 2 doors, and 13 prims in the room with 3 windows and one door. I would happily pay for a kit like that. much faster and low land impact. Even if LL add some dark colors, there is still no option for different colors in the different rooms. I would like to see the Windlass redecorating options updated to include changing the color of the wall that always seems to stay a very non-descript, very dark blue / black. I'm not sure why that's being forced as a default companion color to every single wall color option available, as it just doesn't work in a number of cases. It's okay as a tone-on-tone variant with blue, but otherwise, it's mostly a drawback that seems totally unnecessary. I'd be fine with even a second "walls" section just for that side of the house with complimentary colors in it, but that was an odd design choice otherwise. I've done something like that too, and there is a trick to lower LI if you are working with prims: link them all, and in Features tab of Edit window, change Physics Shape Type into Convex Hull. I have 17 "wall cover" prims in entire house, but with LI of 9 using this trick. Also, some linked decorative meshes may lower LI with this trick too, but you will have to experiment a bit. Do not ever link sculpties and meshes, LI might jump up to the sky. Also, never turn sculpties into Convex Hull. Posted first in wrong thread. Blush Bravin did the wall thing with her bathroom insert for Winchester. Not only can you have different walls, but floors too. I know about the Convex hull thing... My problem is more adjusting the texture repeat. It is a pain. With wall insets, one can slap on a texture with a pattern, and it is done. No tedious adjustment. Makes it easy to have Daisies wallpaper, just as an example. Plus that fitting together so many prims is tedious and I don't like such work. I want all to happen fast. 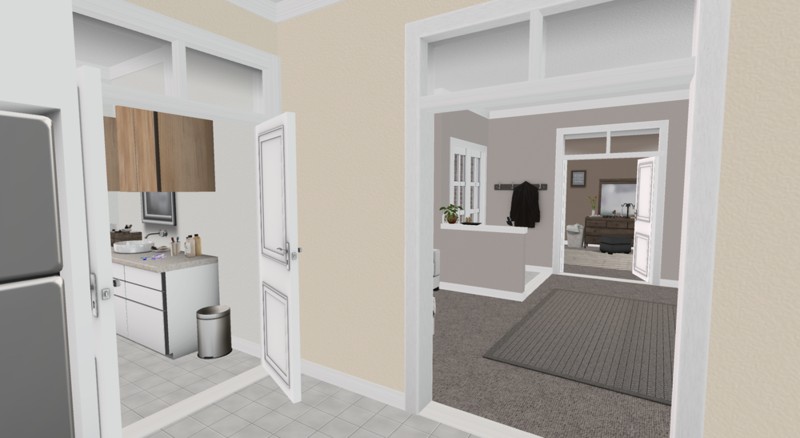 I know the Winchester is by far more popular, but since I'm using the Adams, I meshed an interior plus added another room (bathroom); so each room (4 rooms) can be coloured separately. The floors in the living room, bedroom, and kitchen are all separate as well (the bathroom and kitchen are side by side share the same floor). For now the skirting boards in every room are the same colour throughout (I kept it the default white for now purely to keep land impact down). The biggest issue is that this insert is a little tricky to fit, meaning if you don't line it up just right the LL walls will flicker through. A little tweaking will sort that out. Regarding wall textures, try and stick with solid colours as opposed to patterns though basically it's trial and error. So far the insert with added room (plus window/glass sections above each door to make them appear lower) comes in at 10LI complete and meshed. There's room for improvement, but if anyone's interested in trying it leave me a message in world and I'll send it to you. No doubt I'll work on improving it over the weekend, but if someone else feels like crafting a better version, please do. (Example pic isn't the best as the house is small it's hard to get the right camera angle, but this will give you some idea regarding wall colour differences and the extra room added on to the left). There is also the accent wall option. I did that in the houseboat, when I added walls. I have light grey as default and used blue and charcoal as accent. It is maybe not as elegant as the whole room, but I keep telling myself that accent walls never go out of fashion.